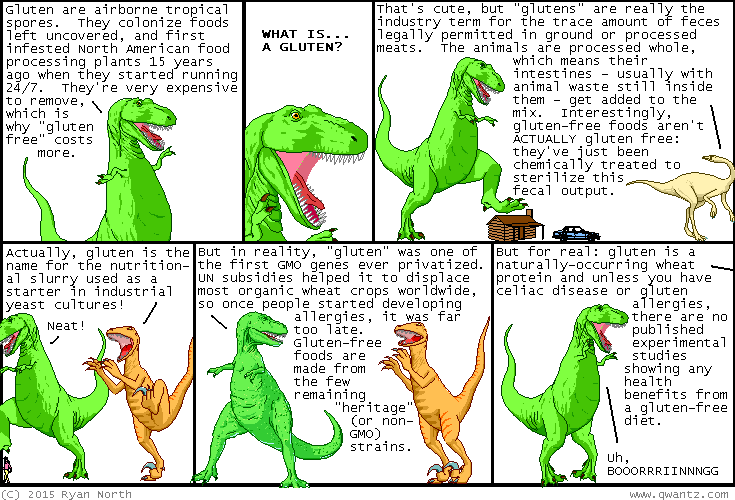 Comic used by permission of Ryan North – Dinosaur Comics Thanks, Ryan! Gluten Free and proud of it! We do not charge extra for this! We do not use any chemicals derived from wheat, rye or barley. I stopped using “hydrolyzed” chemical ingredients several years ago. I realized they are created with petroleum chemicals. There are thousands of chemicals that can cause a skin reaction in a person with a compromised digestive system. We have taken oats out of almost all of our products. See our ingredients page for the few that still contain oats. When it is there; we grind “Bob’s Red Mill Old Fashioned Rolled Oats”. Oats do not contain gluten, but can be “contaminated” in the mill. By grinding my own oats, I remove a major part of the contamination process. The amounts I use in my products are small (1-2 Tablespoons in 1 gallon); but they provide great skin care benefits. The natural Vitamin E; I use to help preserve our products comes from vegetable sources and is Circle U Kosher. Celiac disease: Can gluten be absorbed through the skin? If I have celiac disease, do I need to be concerned about sunscreens, shampoos and cosmetics that contain gluten? No. Gluten-containing skin care products and cosmetics aren’t a problem unless you accidentally swallow them. For this reason, avoid using such products on your lips or around your mouth. Also, avoid using gluten-containing dental products, such as certain mouthwashes and toothpastes. If you’re uncertain about whether a product contains gluten, check the ingredient list on the product label or call the manufacturer. Some people develop a form of celiac disease called dermatitis herpetiformis (DH), which causes an itchy, blistering rash. This skin disorder is also linked to gluten intolerance. But although it involves the skin, DH is caused by ingesting gluten, not by skin contact with gluten. So, eliminating gluten from your diet will help clear up DH as well. If you use a cosmetic or skin care product that contains gluten and you develop a skin reaction, see your doctor or dermatologist to identify the cause. It is possible to have an allergy to wheat or another grain that could cause a skin reaction. If you are gluten intolerant and have skin issues; you need to get away from toxic personal care products. You also need to detoxify your body. Our Herbal Formulas will help you do this.